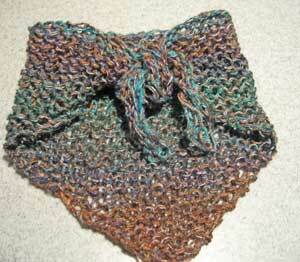 So one of our customers(thanks Martha) knit this up and then wrote out the pattern to share with you. We used only one hank of point five so that you can see how far one hank goes. So it is the day before Thanksgiving and my kids are all home safely....I'm such the worry wart about their safety and thankful that they are here to share time with. That being said I want to share some things with you. 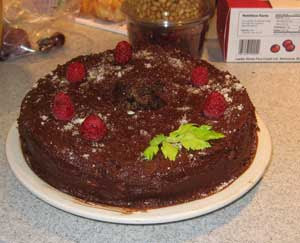 When Anne Hanson was here teaching we had a wonderful get together which included food that I prepared. I had so many people ask me for the recipes that I decided to put it into print. (Thanksgiving seemed like a good time to do it) Four Fifths of my family is vegetarian so I am always looking for ways to sneak some protein into our diet. Just like any contemporary family however, time spent in the kitchen has to be minimal because there are so many places to be! Quinoa is an old fashioned grain that is loaded with protein, I have been trying to use it more and more. 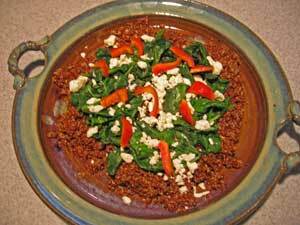 The following is my Protein packed spinach, feta, quinoa recipe. Served in a low platter it is pleasing to the eye and the tastebuds! Ingredients: 1 cup(uncooked)Red Quinoa, 1 can Navy Beans, 1 pack of fresh Spinach, 1 clove Garlic, 3 oz. Feta, Fresh Red peppers(optional for garnish), 1 cube vegetable boullion, tablespoon olive oil, teaspoon lemon juice. Take one cup of quinoa, 2 cups of water, one vegetable cube and bring to boil. reduce to simmer and cook until the water is almost gone(about 15 minutes). Add the olive oil and stir and then put into the serving platter. Place the drained navy beans on top of the quinoa. Take the spinach with a touch of moisture still from rinsing and throw into a saute pan with the garlic. Toss the spinach until it is just wilted and throw on top of the navy beans. Take the feta and lemon juice and sprinkle over the top. Add salt and pepper as desired. Slice the red peppers and garnish the entire platter. This dish is wonderful served at room temperature. The other dish that I served is what I call an eggplant casserole. I'm not sure about the heaalth benefits but I can tell you that is wonderful on the tastebuds! This dish is one of our staples when the harvest has brought in all of the eggplants at once! The other thing I have to say is that it is not a dish you put out to have people ooh and aah over how pretty it is. It is visually ugly and I can not make excuses for it! ingredients: 2 medium eggplants, 1 medium yellow onion, 2 stalks of celery, 1 large green pepper(for kick use part of a hot pepper if you want), 1 16 oz container of mixed grated mexican cheese, 1 16 oz. can of tomatoe sauce. Cube the eggplant skin and all and steam until mooshy. While the eggplant is steaming, chop the peppers, celery and onions and saute until all the vegetables are very soft. Take a casserole dish and mix all the vegetables, sauce and cheese together. Cover the dish and put in the oven for at least one hour.....sometimes baking a little longer improves the flavor. Serve warm with rice pilaf, the spinach quinoa and a nice crisp salad! 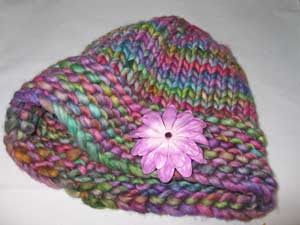 OK Now we need to think about warm knitted and crocheted accessories for the cooler months. Quickie Malabrigo Rasta Hat and Quickie Colinette Point Five Scarf. 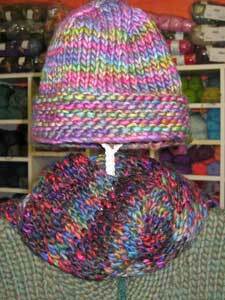 both of these items are done on big needles and make up quickly when you are pressed for time. 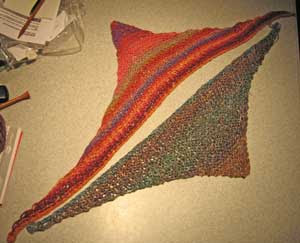 I have run out of time so I will post the pattern for the scarf tommorrow! Enjoy your time with those around you and give thanks for all that is. 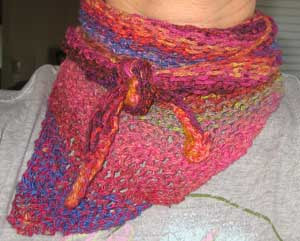 I really wanted to share how the necklet turned out with the Noro King yarn doubled. The colors are so opposite the first one but equally beautiful. I confess I became a color control freak at the end., I really wanted the turqoise to appear so I cut the yarn on one of the strands and pulled it out until I got the turqoise. I recommend that if you want to have the tie you change to a bigger needle at the double sided increase section. This will relax the tie section. You will see from my photos that the King piece came out a little bit shorter than the Tidiori piece. I pulled a bit and got it longer but it would be so much better by loosening the stitch. Well, in honor of simply sweet week I thought I would share this very simple but eyecatching/sweet necklet pattern(I think I just made up the word). I am calling it a necklet because of the way it wears on your neck. Tying the ends into a sporty little knot make it look different than just a triangle scarf....which is what it really is. 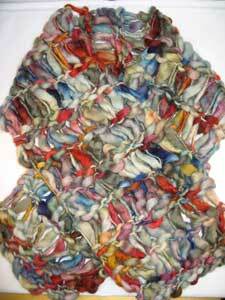 The yarn is called Tidiori and is a discontinued Noro product of which we still have a few balls. I am one of those storeowners that falls in love with a yarn and just has to hold onto it until it is gone. 3)increase at the begining and end of each row until the piece measures 9 inches from the point.